How to uninstall Programs and Features in Windows 7? To uninstall e.g. remove Programs and Features in Windows 7 please open the Control Panel in Win-7 ! It is very easy to Uninstall Programs and extended windows features from Windows 7, Starter, Home, Professional, and other Windows 7 OS x64 and x32, here a short example how to do this! 1.) ... Uninstall installed Programs from Windows 7! 2.) ... Disable or Enable Windows features in example IE11! See also: ► Change Windows 7 Product Key! 1.) Uninstall installed Programs from Windows 7! 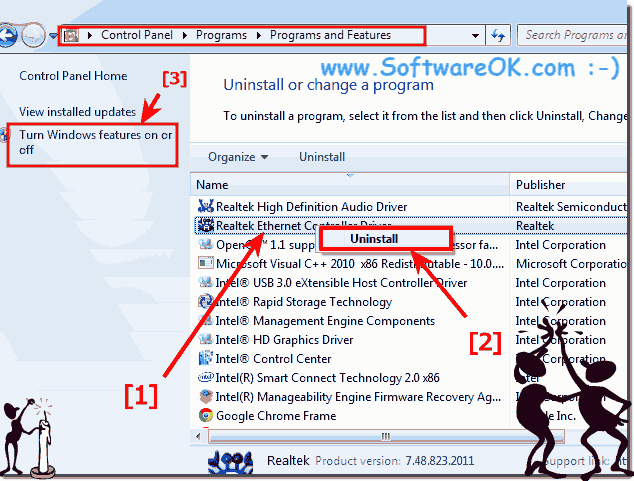 and click Uninstall (... see Image-1 Arrow-2 ) to uninstall the selected Program from Windows-7! "Turn Windows features on or off" (... see Image-1 Arrow-3)! (Image 1) Uninstall Programs and Features in Windows 7? 2.) Disable or Enable Windows features in example IE11! Certain other features are turned on or turned off by default, but you can turn them off if you don’t use them in example Internet Explorer 11 or turned on if you need the Internet Explorer 11. (Image-2) Enable Disable Windows Features in Windows 7! Some Windows 7 features included with Windows, such as IIS, must be turned on before you can use them. Windows-7 - FAQ-72: How to uninstall Programs and Features in Windows 7? How to see all installed Windows updates in Windows 7? How to see my Computer and Network on Windows 7 desktop? Change your Account Picture in Windows-7 or Browse for new Account Image! Can i uninstall a program or features in Windows-7? How to deinstall the Windows-7 Programs? How to see the features in Windows-7? 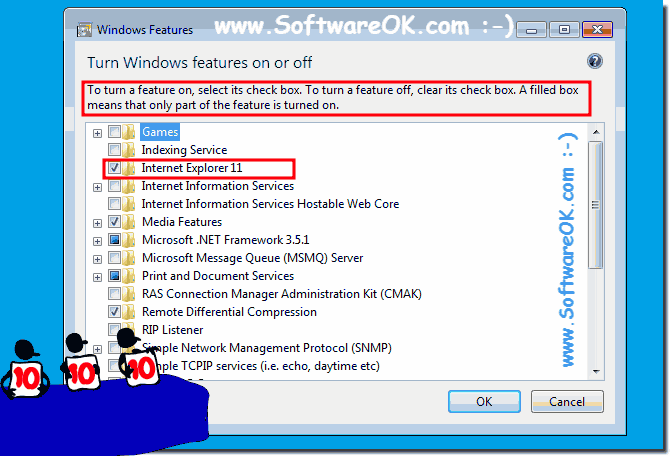 How to activate or instal other features in Windows-7? Win 7 Program uninstaller (Starter and Home)?